Is Being Debt-Free Your Goal? Every day, people draw on money they don’t actually have – via credit cards, payday loans, home equity lines of credit, and even their 401(k)s. Many of them end up making minimum payments on these high-interest loans – a sure way to stay indebted forever. If this is your situation, you may be wondering: how do I get out of debt? 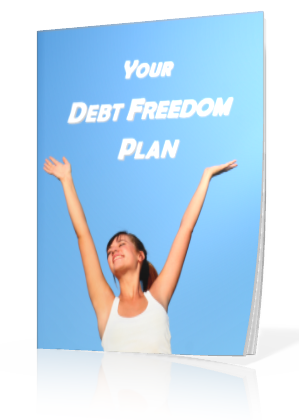 Get started by using our FREE Debt Freedom Report. This report will give you a specific, detailed plan for getting out of debt while building your net worth. No tricks. No gimmicks. Keep the real goal in mind. Reducing debt is but one step in building wealth. Increasing you net worth should be your ultimate objective. Some debt reduction and debt consolidation planners obsess on getting you out of debt, but that is only half the story. Minimizing debt is great, but maximizing wealth is even better. Our FREE Debt Freedom Report can help. You can plan to build wealth and reduce debt at the same time. Why just keep debt at bay when you can leave it behind? Take the time to complete the form below. Talk with an experienced financial consultant who can help you pursue the goal of financial freedom.